Uniquely colored iris adds warm color to the garden when it blooms in mid spring. 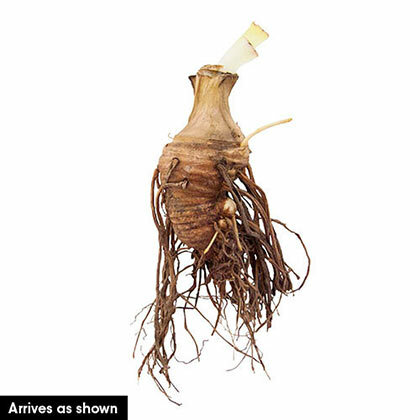 The 5-in., lightly ruffled, reddish-brown petals have a creamy yellow center and bright orange beards. Cut a few flowers for an indoor arrangement or enjoy in the garden. Reblooms in late summer to early fall. Grows 36 in. tall with a 12-24 in. spread. An easy, showy perennial to grow, German or bearded iris are drought and deer resistant. 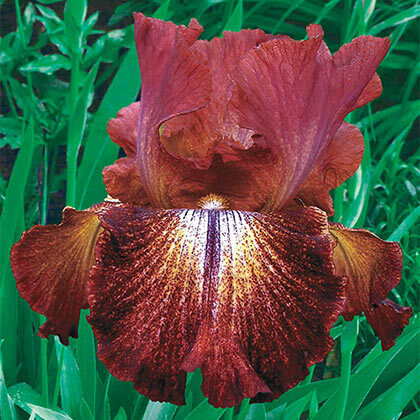 Generations of gardeners have loved iris for their elegance and easy care. Ideal for sunny borders, rock gardens, naturalized areas and perennial flower beds. Plants can be divided every 3-4 years. Plant in full sun to partial shade. Bareroot. Zones 4-9. Spread12-24" Closer planting gives immediate effect, but iris will need thinning often. FoliageGlaucous-green, sword-like fans of stiff upright leaves. PruningRemove spent flower stems after flowering to promote reblooming. Cut back foliage to 6'' fans in late fall. DepthDig a shallow hole 2-4" deep and twice as wide as the rhizome. Place the rhizome on a small mound in the middle of this hole and spread the roots. Fill the hole with soil, but only partially cover the rhizome. Water thoroughly.